How are you going to handle 8K or even 16K data performance and capacity requirements for post-production and media workloads while also simplifying your infrastructure? 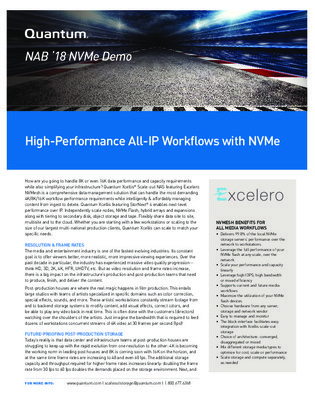 Check out this paper for an overview of Quantum Xcellis® Scale-out NAS featuring Excelero NVMesh, a comprehensive solution that can handle the most demanding 4K/8K/16K workload performance requirements while intelligently and affordably managing content from ingest to delete. The top 12 benefits of implementing the architecture are also included.